Every year ski and snowboard manufacturers tweak their technical designs, make skis fatter, with freaky fun graphics and the winner is the skier. So much new technology has been poured into the latest powder boards and skis product line. We continue to be amazed at how well wide skis carve and how reverse camber can offer control at high speeds too. So many of today’s top skis are true quiver killers – good in deep snow, spring slush, hard pack and groomed corduroy. Here are our editors top ski picks, we have tested at Okemo Mountain Resort in Vermont, Sunday River in Maine and Mt Bachelor in Oregon. We have categorized the best skis for women, best ski for women’s and the ski conditions where each ski performs best. Rossignol 7 Series Skis have really evolved back into top performance skis, stepping out of their rental fleet rut. Our tester loved the Rossi Soul 7’s in deep snow but also ripping arcs on hard pack. Rossignol’s Soul 7 is 106-millimeters with a rocker tip and honeycomb technology that makes it float but also respond fast to turning – perfect for hard charging powder days like we had testing these skis at Mt Bachelor Oregon from the wide open summit to the glades soaked in fresh snow. Rossi Super 7 has a big 116 waist, and the fattest of them all The Rossi Squad 7 is 120mm. Rossignol’s Experience 98 is still a favorite ski of our guy tester, but for 2015 enter the Rossignol Experience 100 for high speed cruising on soft snow. This big mountain ski carves like butter on groomers and even harder surfaces. 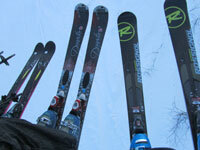 Rossi’s 88s and Rossignol Experience 84s are top on our testers’ list for front side fun fantastic performing skis. If you haven’t experienced the Rossi Experience line, try it, you’ll like it. The Rossi graphics aren’t anything to write home about, need to bring back the Rooster Rossi, Le Coq rocks. Volkl RTM 81, code for Ride the Mountain, are still our fan favorite with a full rocker but metal reinforced that just loves to rip, grip and go fast. For a slightly fatter more forgiving ski, the Volkl Kendo, sounds like Ken Doll – lol, is better for both on and off piste with a 89 millimeter platform. Nordica Five Arrow, Nordica ElCapo and Nordica Soul Rider are all great midsized skis with lots of rebound, from the famous ski boot maker. Nordica’s extensive collection of skis also now includes the new Nordica NRGy, pronounced energy, with 100-millimeters this is a big mountain ski for all conditions from crud to corn to deep. The Soul Rider is a center mounted twin tip – a playful take on Nordica’s fleet that loves bumps and big wide-open cruising, and spraying your followers with freshies. For a fun free ride ski, the Nordica Patron and Nordica Helldorado boast great names and big waists a 113 each – these big bad boys are well balanced with brazen black graphics. Blizzard Bonafide 98 for 2015, like the Blizzard Cochise 108, are the all mountain ski based on the popular performance Blizzard Magnum series. This Bonafide 98 with the trademark Bull on the tip is bold in big snow and mixed conditions. The Cochise, also with Taurus emblazoned tips, requires a bit more focus, not as carefree as the Bonafide – but these are both powerful bullish skis. Blizzard Bodacious at 118 is the big fat bull in the powder room, not for the shy skier. Atomic’s Ritual 103 has been tweaked or 2015 with a single sheet of metal in a backbone shape, making it quick but stiff. For a more race performance Atomic ski, after all – this is where the Austrians ski maker shines, the Atomic Crimson 86 remains at the top of its game for cruising, carving and cutting across the slopes like a ski team champ. Head iSupershape Titan keeps the revered race ski tradition alive and well with a fast unforgiving carving ski. This ski is snappy and responsive, holds the snow and hard pack like Ted Ligety – hence the sponsorship. But this is not the board to be on if your hung-over, you need to be Head’s up. These attention seeking Austrian skis are intense, as are the slightly wider Head Rev 85 Pro which are a bit more relaxed… like a 7 instead of a 9. Head’s ski graphics are very throwback 80s red and blue color block – boring – but a bold race standard nonetheless. Men’s Salomon skis, The Salomon Q Lab 138, and The Salomon X Drive 88, were not a big smile producers for our tester. Too light and not responsive were the remarks. Similarly K2 didn’t grab us, but we have yet to sample the new 2015 K2 Shreditor series which includes the Shreditor 92, 112 and the K2 Shreditor 120 Sean Petit model that’s sure to plow through pow like a free ski big mountain pro. The graphics on these K2s are catchy and colorful too, so stay tuned for that review. Salomon Lumen Q96 is not only a beautiful ski to behold with pretty pastel tree graphics, but this ski is a bargain for the bold performance it delivers. The Q-96, that’s 96-cm underfoot, provides a ride that is glassy and smooth but carves well on hard pack and crust. Salomon has really produced a well balanced skis that you can typically buy for under $500 bucks. The Lumen is light but strong in powder and crud and can still cruise on cruise on cord making nice finished turns from tip to tail. Our tester, heather Burke loved them so much she bought a pair of Salomon Lumens (ok, she likes the graphics) and brought them out west to ski Mt Bachelor. The Blizzard Black Pearl 88 continues to be a winner for women wanting a mid-sized ski that versatile for varying conditions… 88 centimeters at the waist this cool looking Black Pearl ski is quick in short turns but beefy enough to plow through powder and mixed snow. The wood flip core technology allows it to be light but woody. Ladies should wear black pearl if they are a bit edgier than the traditional front side classic pearl girls. Since the Black Pearl was first introduced in 2012, when many Volkl tech guys stepped over to Blizzard, these Blizzard boards continues to tweak their strong ski fleet and the Pearl continues to impress us. Blizzard Viva 810 is a proven winner on hard pack for women. This quick agile ski is beautiful but business-like when it comes to skiing. We continue to call it The Little Black Dress of women’s skis – a wardrobe must and a sure thing in most Eastern conditions. At just 81 under foot its not the best in deep snow, as it dives in to find the substance, but this ski is ideal on groomers and sharp on ice or boiler plate. Its like Irish Spring, “strong enough for a man but made for a woman.” Just a shout out to Blizzard – their 2015 ski graphics are not as pretty – we liked the pearls and lace patterns of previous pairs, now its just plain black with technical stripes and stuff – boring Blizzard. Rossignol Experience 88, while not a women’s ski per se, is just a great all around all mountain ski for gals who like to rip. But there are no pretty flowers, pink swirls or girly graphics. For that you need to hop on the Rossignol Temptation 84 which are more forgiving, feminine and fun. But our lady tester prefers the firm grip and solid edging of the auto-turn Rossi 88s even though they are a bit heavier to carry to the lifts. The Temptation is smooth and silky – definitely ideal for an advanced intermediate mom who likes to cruise. New for 2015 is the Rossi Temptation 88, borrowing from the Rossi 7 series, we have yet to try these babies..stay tuned. Nordica’s Wild Belle isn’t just a great name, its a fun light quick female ski, 88-centimers, that offers versatility without sacrificing performance. Its light and quick but still grips well. The Nordica First Belle is a bit narrower at 82 with similar cool graphics. The HEAD Joy Series – including the Great Joy is a fantastic new free ride ski line for females. Head’s lightwood core with graphene (an extremely thin carbon layer) keeps these ski solid but supple. Head’s Great Joy 98 waist makes it a big ski, so not a good bet for timid skiers. Head is making head turning skis, and equipping much of the US Ski Team. The Head Great Joy and slimmer Head Super Joy 75 are funky looking with a blunt tip – like a ladies mascara wand that does laps instead of lashes. Head’s Big Joy 110s are bit too big for our East Coast tester’s conditions but we bet these beefy blue skis would crush deep snow seamlessly. Rossignol Savory 7 is a super pretty, super fun skis. Like the men’s Soul 7, this Rossi is 106 at the waist, so its wide but light given its honeycomb design. The Savory is floaty and pretty fast, a perfect light powder day ski – but not strong in hard pack…so be a fair weather skier on your sweet stylish teal and white Savory 7s. Volkl was once a leader in ladies skis, K2 was too. We still like Volkl’s women’s ski line up, but the price may not be as competitive as some of the other late to the party skis listed here for ladies. Volkl Aura is a great girls ski for mixed snow and powder with its tapered wide tip and full rocker – but with two sheets of metal its a strong person’s ski. The Volkl Kenja is a fun, front side carver in the Essenza series that’s responsive and likes to rip medium and short radius turns with its 87-width. The Volkl Yumi is pretty, pink and packs a punch on groomed terrain – very forgiving in bumps too. We didn’t demo the Dynastar Cham series, they look as goofy as Salomon’s BBR series and Kastle’s FX boards that retail for over $1,000…but until we ski them, we can’t comment on their performance. Similarly no Atomics made our 2015 must-ski for women’s list and they used to be our go to girl ski.